Is this the conversation about weight loss going on in the background of your mind? HOW DOES IT FEEL TO SAY THOSE THINGS TO YOURSELF? Sad, frustrated, ashamed? Something else? What foods did you like? 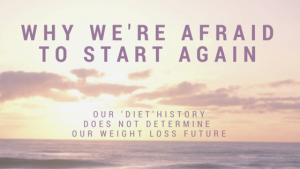 What parts of the diet or plan were sustainable? What types of exercise felt great? HOW DOES IT FEEL NOW TO LOOK AT IT IN A FACTUAL WAY? Calm, in control, curious? Something else? MAKE SOME NOTES AS YOU ASKED YOURSELF THESE QUESTIONS. Food: What foods feel amazing in your body? Activity: What’s a way you love to move your body? Interest: Stay interested in You. What works for you? Love: How can I treat myself with love?